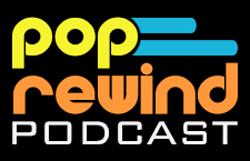 While I am the Canadian half of Pop Rewind, I did spend a lot of time in the U.S. as a kid. People growing up in a border city have many of the same experiences. It was cheaper to cross the border (and it was relatively pain free back in the day) and go grocery shopping or back to school clothes shopping in the States. Me, my best friend, and our families would make frequent shopping trips to Detroit and if we were “good”, we were rewarded with a Treasure Troll. We were obsessed. Besides these little Treasure Trolls, we also had plush dolls, playing cards, pencil toppers, trading cards, and we may have had Troll attire but I really don’t want to think about it. 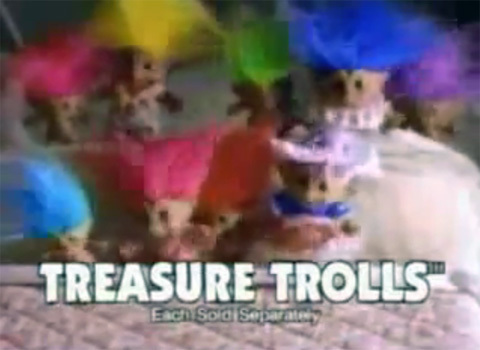 Troll dolls have been around for what feels like forever, but the Treasure Trolls were something new– they had a jewel on their tummy. A gaudy belly button piercing, if you will. At first they came in some cute outfits that showed off these belly jewels. There were also Troll dolls from Russ. I still have my Easter Bunny one proudly displayed on my bookshelf, as seen above in a super 90s photo.